We leave nothing up to chance... so why should you. We believe in educating your before you adopt a puppyy and continue to do so long after. We make sure we educate you about things that can effect dogs. We do everything in our power to test for everything and anything... But things can happen we are talking about living breathing creatures. The great thing is we are the only website that offers a FULL REFUND of the cost of your puppy for the first 5 yrs of life. That's because we care. Dont let this page scare you allow it to educate you. All forms of congenital heart disease occur in dogs. The most common defects are valve malformations (called dysplasias),valve narrowing (stenosis),abnormal openings between the heart chambers (septal defects), patent ductus arteriosus, and Tetralogy of Fallot. Patent ductus arteriosusis a persistent arterial connection between the aorta and pulmonary artery that normally closes at birth or shortly thereafter. In the uterus, the ductus plays an important role in shunting blood away from the nonfunctioning lungs. Many large and small breeds are affected by patent ductus arteriosus. This murmur can often be felt through the body wall-it feels like a washing machine churning. Tetralogy of Fallotis a congenital defect of the heart consisting of four abnormalities that result in insufficiently oxygenated blood pumped to the body. Most dogs with severe congenital heart defects die within the first year of life. Dogs with moderate defects may survive but usually exhibit exercise intolerance, fainting episodes, and stunted growth. In these individuals, heart failure can occur suddenly and unexpectedly. Dogs with mild valvular disease or small septal defects are often asymptomatic; the only indication of a congenital heart defect is a heart murmur discovered on physical examination. Are dogs are all checked for proper heart function and cleared prior to breeding. We have them rechecked every yr. Listen to this.Best listened to with a head set..
We have several vets that we use for all our diagnostic testing. The reason for that is NOT JUST ANY VET can do any test. We go to a special vet ( ophthalmologist EYE VET) to get all our CERF testing done. Since a mother or father dog can pass on eye defects to his and her offspring, all our dogs receive a Canine Eye Registration Foundation exam ( CERF) from a veterinary ophthalmologist yearly. This exam checks for cataracts, retina problems and other abnormalities to ensure they are not being passed on to the puppies. Then when the puppies are 8 weeks old we have them taken in for their Cerf exam. Cherry Eye is not an eye disease and not covered in the warranty. Cherry Eye is a gland issue that surrounds the eye and can be caused by infection and or injury. But is is not an EYE issue but rather a gland third inner eye lid. Shorkies are not known for cherry eye but it can happen. Also eyelashes that turn inward are not covered ans that is not an OPTICAL EYE ISSUE but rather and eyelash follicle issues. All our dogs are evaluated for Legg-Calvé-Perthes Disease prior to ever being bred. Tis disease is also known as ,Aseptic necrosis of the femoral head, osteochondritis juvenilis or coax plana., Yorkies and other toys breeds are known for this disease. Six-Panel Thyroid Test run on him/her. A Six Panel Thyroid Test examines your dogs Thyroid feedback system. A degenerative spinal condition in dogs. Intervertebral Disc Disease (IVDD) is a degenerative disease seen most commonly in dog breeds with shorter legs and longer backs (chondrodystrophoid). The most commonly affected breeds are the Dachshund, Shih-Tzu, Beagle and Cocker Spaniels, however no dog is completely immune to disc disease. In rare instances trauma such as being hit by a car, shot or falling from a height can cause a traumatic rupture of a disc. In the chondrodystrophoid breeds a genetic error in disc metabolism causes the interior portion of the disc (nucleus pulposus) to absorb calcium and other minerals which effectively limit the discs ability to act as a shock absorber between the vertebra. A major difference between disc herniation in people and dogs is that in people the disc tends to move to the side, putting pressure on nerve roots, causing pain but not paralysis, where as in dogs the disc tend to herniate upward into the spinal canal putting pressure on the spinal cord and causing weakness or paralysis. Intervertebral disc disease (IVDD) is a progressive disease both in the degeneration of the disc and the progression (severity) of the clinical signs. A I-V scale is used to stratify dogs with disc disease. Dogs with grade I disease exhibit only discomfort in the neck or back, Grade II-IV patients display a loss of neurologic function from fine motor control to complete loss of motor function. Grade V patients have lost the ability to transmit pain sensation from the appendages to the brain, a functional severing (transaction) of the cord. Dogs suffering from stage I or II disease often respond to medical treatment consisting of anti-inflammatory medications, drugs for pain relief and strict (crate) rest. While dogs more severely affected can be treated medically most will regain function more quickly and regain a greater degree of function if surgical treatment is pursued. If medical treatment is elected, it is critical that the patient be monitored for any signs of progression as a Grade I or II dog can rapidly (within hours) progress to a grade V dog. The prognosis for dogs with Grade I-IV disease is very good with greater than 90% of patients regaining ambulatory abilities in 1-6 months time. The prognosis for dogs classified as grade V is guarded with less than 30% regaining ambulatory abilities. - Breeds most commonly affected are long-backed, short legged dogs, such as the Dachshund, Shih-Tzu, Cocker Spaniel and Beagle breeds. You are covered against this in your warranty. Autoimmune hemolytic anemia (AIHA), also called immune-mediated hemolytic anemia (IMHA), is a common, often manageable but potentially fatal condition in many small breeds dogs. Basically, the dog’s immune system begins attacking and destroying its own red blood cells. This significantly reduces the blood’s capacity to carry oxygen to body tissues, which in turn causes the observable signs of the disease. WHAT IS THE CAUSE OF AUTOIMMUNE HEMOLYTIC ANEMIA? Most of the time, a specific cause for AIHA is unrecognized. Many theories exist, but the ultimate answer is "We don’t know." Dr. Jean Dodds, a veterinarian studying immunology. So there is no way to test for it. We have never expereienced in our dogs personally but we make sure you are covered in our warranty against it. 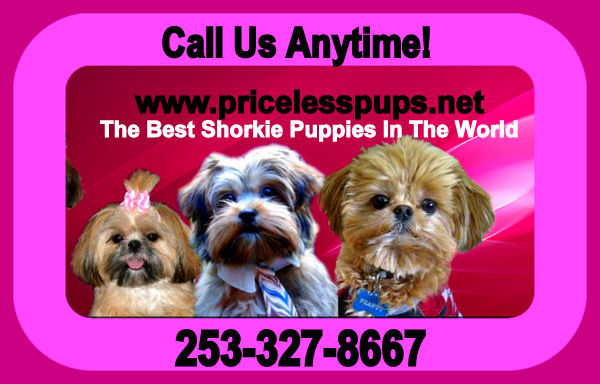 Like we always say.. At Priceless Pups we leave nothing up to chance. The Bile Acid Test is one that measures how the liver functions and performs (as opposed to an static enzyme level reading, that can indicate degree of inflammation or damage). Toy breeds are known for liver issues. Cryptorchidism (Descended Testicles on our Dads). Our males ( Our Yorkie daddies) are cleared for Cryptorchidism which is when one or both testicles fail to descend into the scrotum. Meaning both our daddies have both testicles descended and in place. In the event a puppy is born with an un-descended testicle that will be repaired by my vet at the time of Neuter at not additional cost to you other than the fee of the neuter which is 200.00. What is canine Hip dysplasia (CHD)? Hip dysplasia (CHD or Canine Hip Dysplasia) is characterized by a loose and unstable hip joint. This gives rise to weakness and lameness to the rear quarters, and eventually leads to painful arthritis. Our dogs all have skin scrapings done yearly to ensure no one has any mange and ir skin issues . It can happen to any dog in any breed and yes it is genetic. Demodectic Mange is a parasitic skin disease caused by microscopic mites. Two different mange mites cause skin disease in dogs. One lives just under the surface of the skin, while the other resides deep in the hair follicles. Although both mites share similar characteristics, there are also important differences. It is important not to confuse the two types of mange because they have different causes, treatments, and prognoses. Demodectic mange, sometimes just called "demodex" or "red mange", is the most common form of mange in dogs. It is caused by the Demodex canis, a parasite that lives in the hair follicles of dogs. Under the microscope, this mite is shaped like a cigar with eight legs. "As long as the body's immune system is functioning properly, these mites cause no harm. " Demodectic mange most often occurs when a dog has an immature immune system, allowing the number of skin mites to increase rapidly. As a result, this disease occurs primarily in dogs less than twelve to eighteen months of age. As the dog matures, its immune system also matures. Adult dogs that have the disease usually have defective immune systems. Demodectic mange may occur in older dogs because function of the immune system often declines with age. Dogs who have immune suppression due to illness or certain medications are also candidates for demodectic mange. No, demodectic mange is not contagious to other animals or humans. Demodex mites are transmitted to puppies from their mother during the first few days of life. Since the mite is found on virtually all dogs, exposure of a normal dog to one with demodectic mange is not dangerous. Development of the immune system is under genetic or hereditary control. Thus, an affected dog often has littermates that are also affected. Owners of littermates should be alerted to watch for the development of mange in their puppies. Because the disease is due to a genetic defect, affected dogs should not be bred, and the parents of the affected dog should not be bred again. Surprisingly, a dog with demodectic mange usually does not itch severely, even though it loses hair in patches. The hair loss usually begins on the face, especially around the eyes. When there are only a few patches of hair loss, the condition is called localized demodectic mange. If the disease spreads to many areas of the skin, it becomes generalized demodectic mange. In addition to the above our veterinarians check for common--but serious--abnormalities, including , luxating patella's, heart ,elbows, hips, heartworms, and other parasites yearly to ensure our dogs overall health is is good condition for breeding.